Live Chat 2 Pre-intermediate offers a wonderful opportunity to practice your listening and speaking skills. Talk about labor and retirement, famous landmarks and mysterious places, common illnesses and symptoms, traveling, and more! As an added benefit, Learn English, our amazing e-learning program, will further expand your knowledge in a fresh, interactive way! 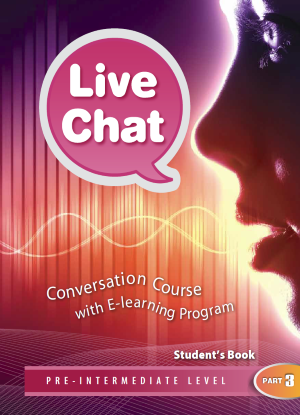 Travel around the world with Live Chat 3 Pre-intermediate! Talk about exotic places, rich ecosystems, and intelligent animals. 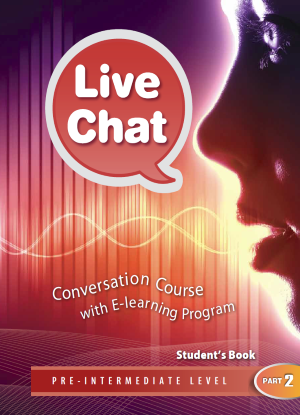 Discuss the power of technology in our lives and consider different career choices. Learn English, our powerful e-learning program, will make a big difference to your language skills!